OXFORD, Miss. – University of Mississippi researchers are among scientists worldwide elated that gravitational waves – ripples in the fabric of space-time – have been observed for a second time. The gravitational waves were detected Dec. 26, 2015, by both of the twin Laser Interferometer Gravitational-Wave Observatory, or LIGO, detectors, in Livingston, Louisiana, and Hanford, Washington. The discovery has been accepted for publication in the journal Physical Review Letters. Funded by the National Science Foundation, the LIGO facilities were conceived, built and are operated by Caltech and MIT. The discovery was made by the LIGO Scientific Collaboration – which includes the GEO Collaboration, the Australian Consortium for Interferometric Gravitational Astronomy – and the Virgo Collaboration using data from the two LIGO detectors. Gravitational waves carry information about their origins and about the nature of gravity that cannot otherwise be obtained, and physicists have concluded that these gravitational waves were produced during the final moments of the merger of two black holes – 14 and 8 times the mass of the sun – to produce a single, more massive spinning black hole that is 21 times the mass of the sun. “The black holes producing the gravitational waves were about three times smaller in size than the black holes we observed in September,” said Marco Cavaglia, UM associate professor of physics and astronomy and assistant spokesperson of the LSC. “Their size is closer to what astronomers observe in galactic X-ray binaries. 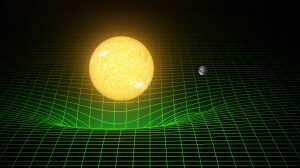 During the merger, which occurred some 1.4 billion years ago, a quantity of energy roughly equivalent to the mass of the sun was converted into gravitational waves. The detected signal comes from the last 27 orbits of the black holes before their merger. Based on the arrival time of the signals – with the Livingston detector measuring the waves 1.1 milliseconds before the Hanford detector – the position of the source in the sky can be roughly determined. The first detection of gravitational waves, announced Feb. 11, was a milestone in physics and astronomy; it confirmed a major prediction of Albert Einstein’s 1915 general theory of relativity and marked the beginning of the new field of gravitational-wave astronomy. The second discovery “has truly put the ‘O’ for Observatory in LIGO,” said Caltech’s Albert Lazzarini, deputy director of the LIGO Laboratory. “With detections of two strong events in the four months of our first observing run, we can begin to make predictions about how often we might be hearing gravitational waves in the future. In the short time since the first announcement, the observation of gravitational waves has already changed how scientists view information coming from across the universe, said Luca Bombelli, a UM professor of physics and astronomy. “Scientists have used it to find out about a distant astrophysical event that we would not have detected otherwise, to study the gravity of black holes and even as a tool to learn more about quantum theory and test predictions of theories on the nature of space-time,” Bombelli said. Both discoveries were made possible by the enhanced capabilities of Advanced LIGO, a major upgrade that increases the sensitivity of the instruments compared to the first-generation LIGO detectors. LIGO research is carried out by the LSC, a group of more than 1,000 scientists from universities around the United States and 14 other countries. More than 90 universities and research institutes in the LSC develop detector technology and analyze data; about 250 students are strong contributing members of the collaboration. The LSC detector network includes the LIGO interferometers and the GEO600 detector. UM has been a member of the LSC since 2007. Researchers in the university’s LSC group include not only faculty, but also many active student researchers at both the undergraduate and graduate levels. Ole Miss contributions to LIGO research are in the areas of instrumentation and data analysis. Virgo research is carried out by the Virgo Collaboration, consisting of more than 250 physicists and engineers belonging to 19 different European research groups: six from Centre National de la Recherche Scientifique in France; eight from the Istituto Nazionale di Fisica Nucleare in Italy; two in The Netherlands with Nikhef; the MTA Wigner RCP in Hungary; the POLGRAW group in Poland and the European Gravitational Observatory, the laboratory hosting the Virgo detector near Pisa in Italy. The weaker signal of this event is important because it shows the detector is sensitive enough to pick up not only large events with extreme energies, but also lower energy events, which are more common, Gladden said. “Every event detected brings new data that can be compared to theory, which pushes our understanding of our universe forward,” he said. The NSF leads in financial support for Advanced LIGO. Funding organizations in Germany (Max Planck Society), the U.K. (Science and Technology Facilities Council) and Australia (Australian Research Council) also have made significant commitments to the project. For more information about LIGO, visit http://ligo.org/.